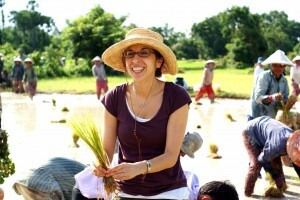 Leah Kaplan Robins in Cambodia. As AJWS’s senior writer and editor, my job is to put AJWS’s complex work—helping marginalized people in the developing world realize their human rights—into words. I tell stories about activists around the globe, trying to bring their lives and challenges alive for AJWS supporters who’ve never met them—or who may have never seen this kind of poverty and injustice themselves. What may surprise you is that, until just recently, I hadn’t seen it either. For the past four years at AJWS, I have portrayed communities and human rights struggles by hearing stories from colleagues, interviewing our grantees when they visited New York, and pouring over photos from our staff, volunteers and grantees to glean images and feelings that I could convey on the page. 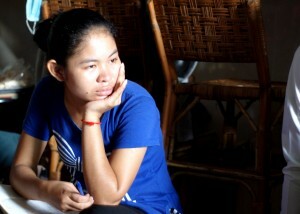 But two weeks ago, AJWS sent me into the field with two of my colleagues—to Cambodia. For the first time, I stood face-to-face with the people whose struggles we’re funding—in their own communities. While this one trip can’t encapsulate the diverse range of places AJWS works, it provided moments of deep connection that I can now share with you, and that will inspire my work for a long time to come. On our first day in Cambodia, we drove to the edge of Phnom Penh, where the tight rows of shiny hotels, restaurants and Buddhist temples gave way to low-slung buildings housing factories and blocks of run-down apartments hemmed with chain-link fence. Cows wandered and children played in the dusty alleys as dusk fell and the oppressive heat began to thin. My colleagues and I entered a doorway and found ourselves in a one-room house where a dozen young women sat on the floor, faces tipped up at us in expectation. I settled down on the cool tiles and returned their bows of welcome, hands pressed together before my lips. The women could have been school mates, with their fresh faces and girlish smiles—but their studies had been cut short. Now in their late teens and early twenties, all had been forced to drop out of school at a young age to earn a few dollars a day working in a garment factory in Phnom Penh. Most had left parents, husbands and even children behind in villages throughout the country and were living here alone—sending home whatever money they could. Through our translator, I listened to them speak of 14-hour days in sweltering, airless warehouses, of slave wages and of the severe limits to their personal freedom. They were given just one public holiday off a year—and taking a single sick day usually meant a pink slip. Of course, many of us are aware that behind the labels on our shirts are stories like these. But how often do we meet the people whose fingers hold the needles? As the young garment workers spoke about their experiences, I watched their hands, imagining them working the machines hour after hour for $2 a day. I fingered the hi-tech wicking fabric in my shirt and began to quietly calculate its human cost: from head to toe I was wearing more than two months’ earnings. But the women drew me back with their optimism, becoming animated as they described their efforts to unionize. All had been recruited as leaders by Worker’s Information Centre (WIC), an organization that works to organize garment workers to advocate for their rights. With WIC’s help, they had recently staged a strike that made progress on 11 of their 16 demands of the owners, and had convinced more than a thousand of their peers to join the new union in just seven months. One of my colleagues spoke eloquently about how proud AJWS is of what they’d accomplished and how we hoped they would secure increased wages and sufficient income to move to more comfortable surroundings. But I think this young woman wanted to hear a darker truth: that in the small, hot room, I wanted to hide in shame for all that I have and take for granted, and for the things that fill my closet without concern for those who sacrificed to sew each seam. Part of my discomfort lay in the knowledge that even if I were to scrupulously avoid “Made in Cambodia” tags it won’t solve the systemic problem. This isn’t the only country where people work under inhumane conditions or where companies exploit the labor of the vulnerable. And the fact is, these women desperately need these jobs. In the days I’ve had to digest this experience, I’ve come to realize that the most productive action is to support the work that garment workers themselves are doing to advocate for a more just labor system. They want to work, but they deserve to earn a greater percent of the huge profits reaped by the corporations that sell these clothes. They need safe working conditions, longer breaks and access to sick pay and parental leave. This is where my pride in AJWS swells. By funding WIC, AJWS is providing these young women with information, resources and the support to build a powerful movement to tell the owners that they will not stand for the status quo. Their efforts are clearly having an impact, as the factory is beginning to respond to their demands. I’m proud that through AJWS, I am supporting their struggle, helping each one of these women gain the rights she so deserves. Leah Kaplan Robins is the senior writer and editor at AJWS.